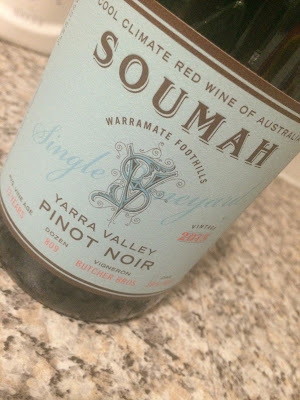 This comes from Soumah’s more premium range, although the prices aren’t all that premium in Yarra terms. Great packaging too – cool ‘duck egg’ blue. Sourced from the Butchers Block with three clones of Pinot. Just 809 dozen made, 30% new oak, 7 day cold soak. pH 3.65 TA 6. Like many 2013 Yarra Pinots this is a much darker wine than the norm, especially for Soumah. It works here though, giving this an extra oomph of black/red berry fruits. The palate is rather dry and extractive, the red fruits struggling to escape from the alcohol and drying tannins a fraction, with a sweet and sour finish. For all that burliness this has some impressive power and so much potential and I really like the dry, twiggy tannins. Will probably look great in another 12 months time. Would I buy it? Not quite yet. In another year? More likely.